In order to live well in the present, we must learn how to deal with the past. While visiting our daughter and son-in-law (Nicole and Tirus) a few weeks ago, Terry and I heard a wonderful sermon about “Stones of Remembrance” from Joshua 4. I credit Pastor Joel for key thoughts for this article. In Joshua 4 we find the children of Israel crossing the Jordan River after wandering 40 long years in the wilderness. This crossing was no ordinary fording of a river! God miraculously dried the Jordan, allowing the people to pass over to the Promised Land, even during the rainy season when the river was at its peak. During the crossing, God instructed Joshua to have some men gather 12 stones from the middle of the river and bring them to shore (see Joshua 4:3). These stones were to serve as “a sign among you” (v. 4) and “a memorial to the people of Israel forever” (v. 7b). The wonders of God must not be forgotten…especially for the next generation! God proclaimed, “In the future, when your children ask you, ‘What do these stones mean?’ tell them that the flow of the Jordan was cut off before the ark of the covenant of the Lord” (vv. 6-7a). 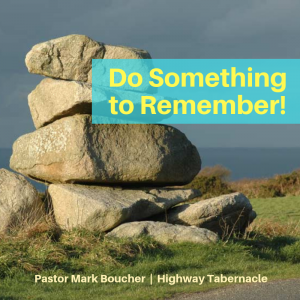 So, what does God want us to remember? What has He done in the past year (and years) that we must call to mind and share with others? He is the faithful God who saves us and keeps us! He proves His love and kindness by providing for us and answering our prayers. May we not forget Him by whining and complaining when we experience trials. Do something tangible to remember the Lord. It may not be stones that you set up, but at least write down answers to prayer and blessings that have come your way in 2018. In the sermon next week, during our vision-casting Sunday, I will be sharing some of these “stones of remembrance” so we can remember and rejoice in the Lord and His grace toward us.